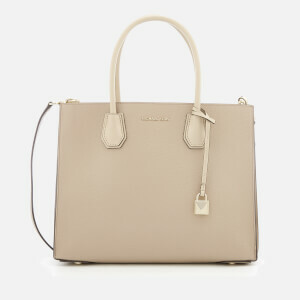 Women's leather tote bag from Coach. Inspired by archival designs, the 'Swagger 27' is slightly smaller than the original and utilises pebble leather to form a softly structured design. Statement belting with double-turnlock hardware adds extra detail to the design, while a top zip fastening keeps the fabric-lined internal secure. Within, the spacious bag offers single zip and slip pockets for safe storage. Finished with two rolled top handles and a detachable shoulder strap. Complete with embossed branding, removable dog tag charms and protected metal feet to the base. Gunmetal hardware. Dimensions: H: 19.5cm x W: 27.5cm x D: 13cm. Handle Drop: 11cm. Strap Drop: 48cm.